Shiny stuff for video games. I haven't been around much making things-wise lately because creativity has been at a low ebb for the past month and a half here in Aquilegialand. But sometime back I made some default replacement clothes, and after a while of actually playing and seeing them in action I could decide which ones were good enough to share. A couple have built-in mesh edits that don't change the mapping so existing recolors will still look fine -- in fact, they will look even better because I made the meshes look better! There is one exception but you'll see that when we get to it. Thanks to Pooklet, CuriousB, and Aelia for color actions. AS WITH ALL DEFAULTS, THERE CAN BE ONLY ONE (per item). This shirt is for TF-EF. 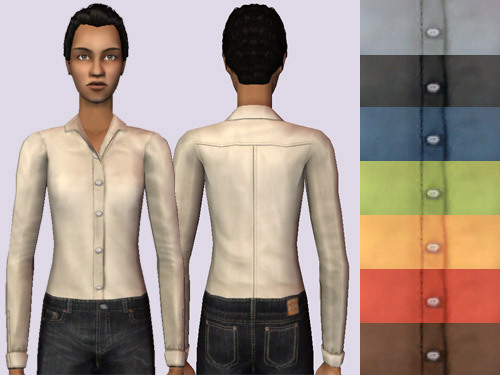 I lengthened the shirttails considerably so there won't be a gap if you end up with a townie with this shirt and a low-rise or untucked bottom. This works fine with CatOfEvilGenius's mesh edit of this shirt. Textures are basegame and H&M, edited and blended. This skirt is for AF-EF. 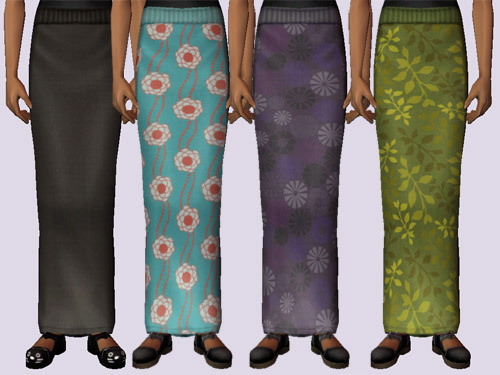 This works fine with CatOfEvilGenius's mesh edit of this skirt. Textures are heavily blended and edited from various EPs, with my linen overlay. The three patterns are from Ana Romero Designs. Shoe alpha edit is from Fakepeeps7, shoe textured edited EAxis with the exception of the the cat shoes, which are from Ja. This is the dress with the low back, crisscross straps, and has a few versions with side cutouts and one gross pink animal print. Textures are from GLS and Store, with a velvet overlay from gild_a_stock on deviantArt and a victorian scrollwork overlay on three dresses that's similar to the overlay on my Petals skirts. Some of the alpha on the top of the dress is from one of Nilou's outfits. Alpha on the shoes is by me, textures edited EAxis with a textured leather overlay. This has an edited mesh! I lowered the heels and reshaped the shoes into flats and added a preg morph. The mapping is identical to the default mesh so any retextures you may have will display properly with the new shape of the shoes. Textures are from AL and heavily edited, with the lace cuffs on the leggings from the Lace Brush set by CourtHouse on deviantArt. Shoe alpha in part from Stajil, with the textures edited EAxis with a textured leather overlay. Also known as those hideous jeans with an even uglier belt that Brandi Broke wears. This is for TF-AF, and has an edited mesh! I've widened the legs, lowered the crotch, removed the waist ridge, and added a pregmorph. Rather than bang my head against trying to figure out how to get those sandals to work or go away, I decided to keep these casual, comfortable linen trousers. Not pictured is an extra color only teens have in CuriousB's Bullfinch (a sort of orangeish pink). Textures heavily blended and edited from FT, Basegame, and AL, with my linen overlay. Sandals have a textured leather overlay. Don Lothario's iconic outfit. This has an edited mesh! 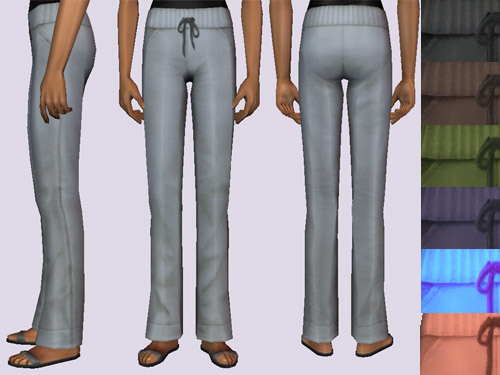 I slimmed it, made the fat morph consistent with my improved fat morphs, added a pregmorph, and made the jeans fall more like loosefit jeans should. Textures are from H&M and TSS and edited heavily (the shoes in particular look a million times better). Pattern overlays are by Squidfingers. 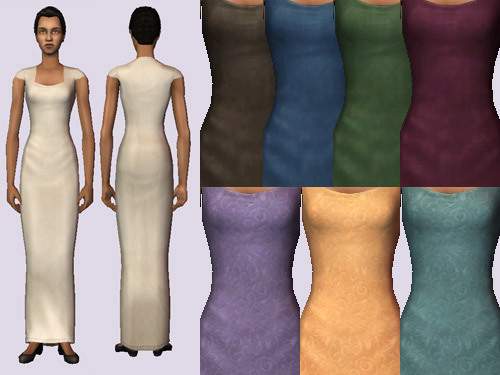 This has a completely different mesh -- existing recolors won't look right! (I dislike the original too much to be bothered about that, sorry.) This is actually my workshirt mesh. It's similar to the default Ja made, but I like my mesh better than the one she used because it's more fitted and the fat morph doesn't explode. I thiiink this has a pregmorph, too. Textures edited from H&M. Thanks to Ja for the original package I used to make mine. YAAAY. Dear god, how long I've hated Don's outfit's shape, the cowboy shirts, and Brandi's jeans! Thank you so much for these! The mesh doesn't seem to be included for the Don outfit. Either that or I am a derp and missed it. 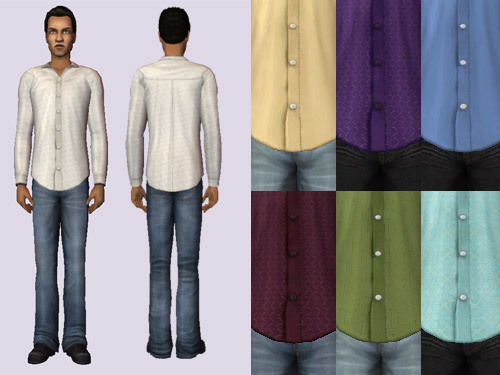 The mesh doesn't seem to show up on the male cowboy shirt default for me, either - I don't have AL or M&G, if that's it? 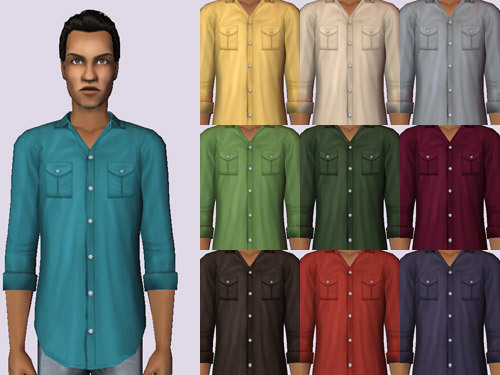 I can see a coloured strip below the old level of the shirt, but the main bulk of it is invisible (I have an invasion of floating townie heads haha). Oh huh, that's weird. I'll have to check this out -- it's been quite a while since I fired up the game so I'm not sure what's what anymore, haha. I'll try to get back to you soon. Thanks for looking into it, aquilegia - it will be great to get your default shirts in my game (I've been scouring my downloads to see if I'm responsible for the vanishing torsos, having a default already or whatever, but I can't find a clash in there anywhere). Blimey, has it really been over a year?! Anyway, thought I'd drop back to say that I've *finally* fixed my problems with defaults that apparently had missing meshes; I was using Simwolf's clothing mod (from MTS - basically, it unlocks clothing for YA-Elder) and that apparently conflicted with this. Now there are many more defaults around, I no longer need Simwolf's mod (albeit absolutely brilliant). It isn't. I opened the file in SimPe and there were only textures. Oh these really look great! What have you done? Now I must slog through all my defaults again so I can use yours! ;) Thank you! It's definitely still there, so it sounds like Mediafire is being a pain for you. Have you tried downloading it at different times, or with a different browser? If that doesn't work, let me know and I'll upload it to Box. I got it. Thanks so much! I love the attention to detail you put into your creations. And I just LOVE the basegame hairs! I really love these defaults and want to thank you for creating and sharing them. I'd also like to point out that the link to afbottomshortskirtshoes has an extra 'h' at the beginning and so doesn't work as coded. Sorry to bug but the link to the skirt replacement is broken. There was just a bit of a typo in the url, I've fixed it.